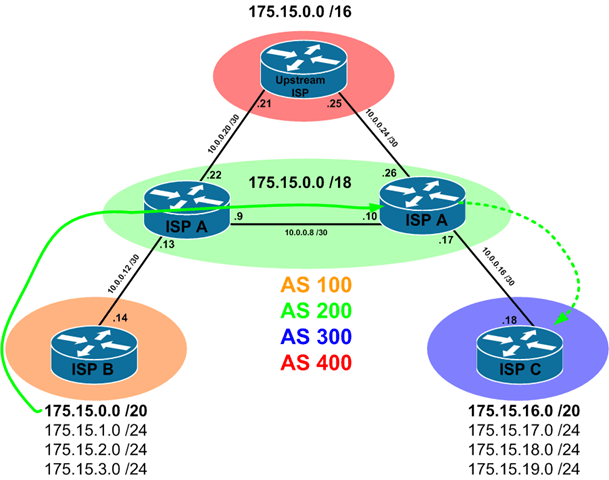 I hope you are starting to get the point, but there are a ton of different maps that can be configured with BGP. The next one I want to cover is the advertise-map. These maps tell the router which prefixes should part of the aggregate. This becomes particularly handy when dealing with the as-set variable on a BGP aggregate. However, lets test this out without as-set first so you get an idea of how it works. Immediately after removing the routes we look at the BGP table and see that we are no longer advertising the /20 aggregate. This is because we told the router that the aggregate was comprised of the first two /24 prefixes. As with any aggregate, if there are no matching (generally smaller) prefixes within the aggregate in the routing table, the aggregate is not advertised. Pretty straight forward right? An interesting use case involves the as-set variable on the aggregate command. Let’s restore the lab and take another look at how this works in conjunction with the as-set command. There are some flaws with this design. Namely, if the ISP A iBGP peering fails ISP C will lose the /18 aggregate since it’s being built on the prefix coming across that iBGP peering. However, it is another tool to keep in your BGP belt.